Taxpayers lose on subsidizing NKT. 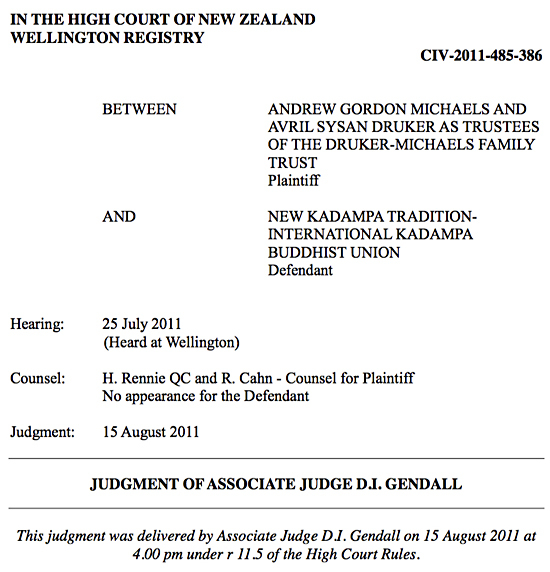 NKT has often boasted its litigation prowess over the past 15 years. NKT threatened to sue media outlets, a book publisher and various individuals....after NKT had trashed them on the Internet in an array of web sites. Litigation was a notable topic at NKT's 2008 summer festival with witnesses reporting that Kelsang Gyatso was himself involved in litigation planning. Instead, NKT was sued, and lost...creating yet another target for NKT's pompous trash talk and threats. "No opposition from the defendant was filed or served with respect to the summary judgment application, and no application has been made since for leave to defend the claim for quantum. There was no appearance on behalf of the defendant on the hearing of this quantum claim." The court awarded the plaintiffs over $1 million, adding that further costs incurred by the plaintiff will likely increase NKT's bill from the court.